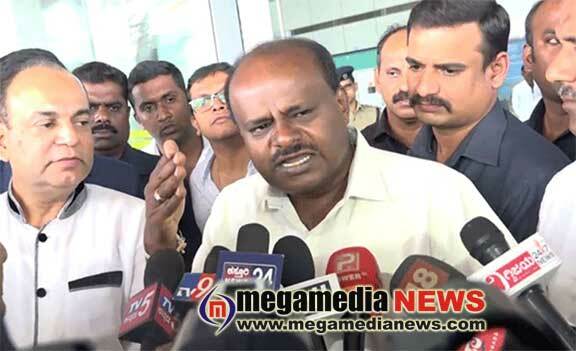 Mangaluru: The Narendra Modi-led NDA government at the Centre is that it had “decimated” the constitutional institutions in the country during the last five years said, Chief Minister H D Kumaraswamy om Sunday at Mangaluru International Airport. Addressing reporters at the Mangaluru International Airport (MIA) on his arrival here to campaign for Congress-JD(S) alliance candidates in the coastal belt, he said the BJP MPs in the region had “failed” to address the problems of people in the region. Citing the Centre’s decision to privatise airports including MIA and the merger of profit-making Vijaya Bank with the Bank of Baroda, he sought to know from BJP on what count the people in Dakshina Kannada district should vote for them in the coming elections. He said the self-respect of people belonging to the region has been hurt by these decisions. Can Prime Minister Narendra Modi, who is scheduled to come here on April 13, ask votes from people for these ‘achievements?’ he asked in a sarcastic tone. The Chief Minister criticised the media for being “unethical” while covering news relating to the JD(S). The media is behaving as if elections were being conducted in Mandya alone and is churning out fake news about the chances of his son Nikhil Kumaraswamy, who is contesting there. He said the JD(S) was sure about Nikhil’s victory, but the media was spreading false news without understanding the ground reality in the constituency. The truth would be revealed once the results were out on May 23, he said. Kumaraswamy said the Congress and JD(S) were working in tandem to recapture Dakshina Kannada, Udupi and Uttara Kannada Lok Sabha seats in the coming elections. Congress president Rahul Gandhi will visit Mangaluru next week for campaigning, he said. Later, the Chief Minister left for Karkala to address a joint meeting of Congress and JD(S) leaders and workers. Mangaluru’s international airport is now named as Koti- Chennaya ?